Biodiversity is the variety of all life forms on earth - the different plants, animals and micro-organisms and the ecosystems of which they are a part. In this unit we will see how diversity changes through succession, genetic diversity, limiting factors and human activities. Biodiversity can be identified in a variety of forms, including species diversity, habitat diversity and genetic diversity. In what ways might the solutions explored in this topic alter our predictions for the state of human societies and the biosphere some decades from now? Unsustainable development can lead to species extinction. Given the five mass extinctions of the past, is this something that the human race should be concerned about? What effects could species extinctions have on human societies in years to come? 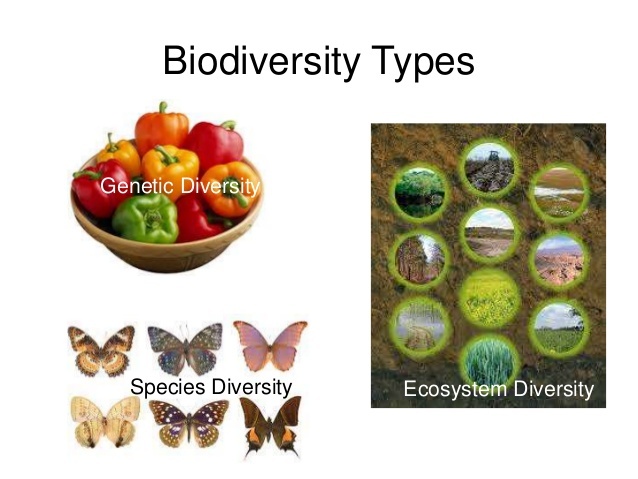 3.1.U1 Biodiversity is a broad concept encompassing the total diversity of living systems, which includes the diversity of species, habitat diversity and genetic diversity. 3.1.U4 Habitat diversity refers to the range of different habitats in an ecosystem or biome. ​3.1.U5 Genetic diversity refers to the range of genetic material present in a population of a species. Each individual species possesses genes which are the source of its own unique features: In human beings, for example, the huge variety of people's faces reflects each person's genetic individuality. The term genetic diversity also covers distinct populations of a single species, such as the thousands of breeds of different dogs or the numerous variety of roses. ​While some individuals might be able to tolerate an increased load of pollutants in their environment, others, carrying different genes, might suffer from infertility or even die under the exact same environmental conditions. Whilst the former will continue to live in the environment the latter will either have to leave it or die. This process is called natural selection and it leads to the loss of genetic diversity in certain habitats. However, the individuals that are no longer present might have carried genes for faster growth or for the ability to cope better with other stress factors. 3.1.U6 Quantification of biodiversity is important to conservation efforts so that areas of high biodiversity may be identified, explored, and appropriate conservation put in place where possible. Biodiversity in a given area is dependent on many different parameters and the interrelationships between these factors. an ecosystem’s capacity to survive change may depend on diversity, resilience and inertia. A complex ecosystem with its variety of nutrient and energy pathways provides stability. Stability lead to diversity. Succession increases species diversity as there are new habitats been formed and a more complex ecosystem had been formed. 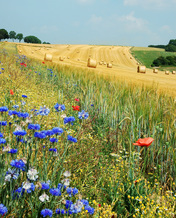 Grasslands - low diversity and inertia, high resilience – rich soils. 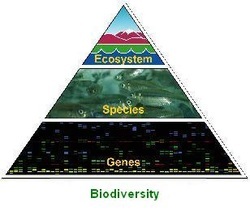 3.1.A1 Distinguish between biodiversity, diversity of species, habitat diversity and genetic diversity. ​Biodiversity: The amount of biological or living diversity per unit area. It includes the concepts of species diversity, habitat diversity and genetic diversity. genetic diversity: the genetic range that is present in a population of a species. Species that have a small genetic diversity are more at risk of being wiped out by diseases. Selective breeding by humans to domesticate animals or grow plants with specific traits has reduced the gene pool in many species. species diversity: the range of species living in a specified area. An area may have a high density of wildlife, but if they are all from a few different species then it would have a low species diversity. 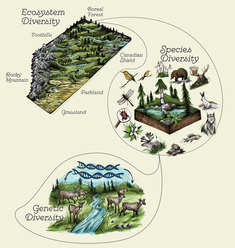 habitat diversity: the range of different habitats in an ecosystem. Jungle or forest ecosystems are likely to have a higher habitat diversity than desert or tundra ecosystems. This is the total number of species living in an ecosystem. Recently attention has been focused on global biodiversity and the extinction of species due to human activities. We have not explored every part of the biosphere yet. Most species are less than 1mm long so they are easily overlooked. Apart from the popular taxonomic groups like birds and mammals there are not enough experts to identify the more obscure and "esoteric" groups. Species become extinct before they have been discovered. ​3.1.A2 Comment on the relative values of biodiversity data. 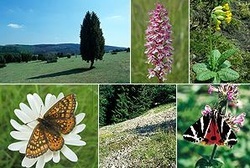 3.1.A3 Discuss the usefulness of providing numerical values of species diversity to understanding the nature of biological communities and the conservation of biodiversity. ​A key tool used by conservation biologists to assess the effect of the disturbance is use of diversity indices, such as the Simpson’s index. Quantification of biodiversity in this way this way is important to conservation efforts so that areas of high biodiversity are identified, explored, and appropriate conservation put in place where possible. Areas that are high in biodiversity are known as hotspots. They contain large numbers of endemic species (species not found anywhere else), and so measures of biodiversity are essential in identifying areas that should be protected against damaging human activities. An example of a biological hotspot is Tumbes-Choco-Magdalena, an area that includes the forests of the South American Pacific coast (from Panama to Peru and the Galapagos Islands). NWF Why is Diversity Important? Click here for a short population dynamics quiz from Nature Works. Here's a virtual handbook on population dynamics - Thomas Brey in Germany. Another good island biogeography animation showing the physical migration, real-time data, and a graph. The term "biodiversity" has replaced the term" nature" in much literature on conservation issues-does this represent a paradigm shift? Diversity index is not a measure in the true sense of a word, but merely a number (index) s it involves a subjective judgment on the combination of two measures: proportion and richness. Are there examples in other areas of knowledge of the subjective use of numbers? International scientific collaboration is important in the conservation of biodiverse regions. The Socotra archipelago in the Arabian Sea supports so many diverse and unique species that it has been described as the most alien place on Earth. Hank takes you on a tour of this weird place in this episode of SciShow. Paul Andersen explains the importance of genetic variation within a population.